News » Culture of Resistance » Indigenous Autonomy » From Unist’ot’en Camp: What Does Solidarity Look Like? From Unist’ot’en Camp: What Does Solidarity Look Like? Each night Unist’ot’en Clan spokeswoman, Freda Huson, and her husband Wet’suwet’en hereditary chief Toghestiy fall asleep on their traditional land not knowing whether the Royal Canadian Mounted Police are going to storm their bridge in the depths of night. Each winter, when Freda and Toghestiy ride their snowmobiles down forestry roads to bring in supplies, to hunt, or to check their traplines, they don’t know whether they will find piles of felled trees maliciously dragged across their paths. Each time Freda and Toghestiy leave their territory for a few days they don’t know if they will return to find another attack in an old tradition of cowardly arson perpetrated by hostile settlers on Wet’suwet’en territories leaving smoking embers where their cabin once stood. I ponder this as I sit in a workshop with other settlers during the 6-day Unist’ot’en Action Camp – a series of workshops hosted on the traditional territories of the Unist’ot’en Clan of the Wet’suwet’en Nation to promote strategic planning and co-ordination in the struggle against the spread of fossil fuel pipelines. This particular workshop is designed as a discussion to promote understanding about how settlers can work in better solidarity with indigenous peoples struggling to protect their homes and carrying out their responsibilities to the land. Most of the ideas discussed revolve around decolonizing our hearts and minds to learn to see the role non-indigenous peoples are playing in the genocidal processes threatening the survival of indigenous peoples. Some of the ideas involve material support for indigenous peoples engaged in front line resistance like the Unist’ot’en. A few even suggest that settlers become physically present next to indigenous peoples on the front lines. A common scene from my life as a public defender shows me – a white man in a suit and tie – sitting next to a shackled African, Chicana, or indigenous mother in a courtroom. In front of us sits a judge – an older white man in black robes. Across from us sits the prosecutor – another white man in a suit. Directly behind us, where he is felt more than seen, stands a big white man in the brown uniform of a sheriff’s deputy. He has a gun on one hip, a taser on the other, and the keys to my client’s shackles on a loop on his belt. My client stares at the judge in a mix of horror and hatred as she is sentenced to prison for stealing from a supermarket to support her children or for lying to a police officer about her name because she had outstanding parking tickets and had to get the kids to school or for punching a cop when the latest in a long list of arbitrary stops by police officers finally caused something inside of her to snap. I cannot meet her gaze. I tell myself there’s nothing I can do. There’s no argument I can make to sway the judge. There’s no way to stop the sheriff’s deputy behind us from leading my client back down the long concrete tunnel connecting the courthouse and the city jail. I try to comfort myself. What does she want me to do? Yell at the judge? Tackle the deputy? Spit on the prosecutor for his role in sending this mother to jail? 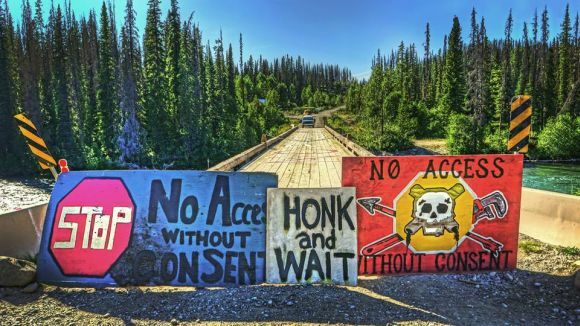 We gathered to sit on wooden benches arranged in a half-circle on a hot and sunny morning during the Unist’ot’en Action Camp to listen to two indigenous men speak about their experiences on the front lines of resistance. Each man had been shot at by police and soldiers, each man had served time in jail, and each man received utter respect from each individual listening. The first man faced 7,7000 rounds fired by the RCMP at the Gustafsen Lake Stand-off in 1995 when a group of Original Peoples occupied a sacred site on a cattle ranch on unceded Canoe Creek First Nation land because the rancher tried to prevent their ceremonies. For his part at Gustafsen Lake, he was sentenced to five years in prison. During the Oka Crisis in 1990 when the town of Oka, Quebec sought to build a golf course over a Mohawk burial ground, the second man and his comrades blockaded several small British Columbian towns shutting down their local economies. He, too, was convicted and spent time in jail for his actions. The second man said the blockades were carried out “in solidarity” with the resistors at Oka. This was the only time either of the men mentioned the word “solidarity.” They spoke of supporting resistance, praying for resistance, and helping with ceremonies. But, it was only when engaged in actions where co-resistors placed themselves in similarly dangerous situations that the term “solidarity” was used. Meanwhile, in Gaza, occupying Israeli bulldozers are demolishing the homes of Palestinian families with suspected ties to Hamas while colonial Israeli bombs are indiscriminately falling on men, women, and children adding to the pile of dead numbered at well over 500 corpses and counting. Put yourself in Gaza right now. Dig a pit in your back yard, turn your ear anxiously to the sky, and keep the path to your back door clear, so that when you hear the hum of jets overhead you can sprint to your makeshift bomb shelter. Look down the street for bull-dozers. When you spot one, grab the nearest bag in a panic, shove as much food into it as possible, scramble for some clean underwear, find your toothbrush, and sprint out the door without a look back for the nearest safe space. Stand over the broken corpses of your children in the pile of dust and ashes that used to be their bedroom. Moan. Weep. Wail. When you wake up for the first time without crying, feel the anger burn through your chest and down your arms into your clinched fists. Ask yourself what you should do next. Ask yourself: What does solidarity look like? Maybe there really was nothing I could do to stop my clients from being hauled to jail in those courtrooms of my past. Unfortunately, I tried not to think about it too much. Placing myself in that vulnerable of a situation was too scary for me. If I argued too strongly, too fervently the judge could fine me. If I yelled at the prosecutor I could be held in contempt of court. If I spit on him, I certainly would be held in contempt of court. If I tried to stop the deputy, I would be tasered and taken to jail. I might even be shot during the scuffle and killed. The truth is indigenous and other resistors are being dragged to jail, tasered, and even shot and killed every day on the front lines. And, they’ve been on the front lines for a very long time. I’ve realized that freedom from the vulnerabilities frontline resistors experience is a privilege and the maintenance of this privilege is leaving resistors isolated on front lines around the world. It is time we understand exactly what solidarity looks like. Solidarity looks like the possibility of prison time. Solidarity looks like facing bullets and bombs. Solidarity looks like risking mental, spiritual, and physical health. Solidarity looks like placing our bodies on the front lines – strong shoulder to strong shoulder – next to our brothers and sisters who are already working so courageously to stop the destruction of the world. This entry was posted in Indigenous Autonomy, White Supremacy and tagged DGR writing & analysis, Privilege, Unis'tot'en Camp, Will Falk, 4: Civilization is based on hierarchy on August 3, 2014 by DGR Colorado Plateau.